Back in the 1960’s, Nickey Chevrolet in Chicago, IL was the place to go if you wanted to overhaul your Chevrolet. Whether it was the Nova, Corvette, Camaro, Chevelle, it didn’t matter. Nickey’s extensive parts department and tuning shop had you covered. Unfortunately, like all good things, Nickey Chevrolet (in its original form) was only around for a few years and in the 1970’s it was sold to new owners and renamed Keystone Chevrolet. The shop continued to churn out high-performance cars but in 1977 the business model was no longer sustainable and the doors were closed. However, a few years ago a shop in St. Charles, Illinois resurrected the name and now a new era of high-performance Chevrolets have begun to wear the name – complete with the company’s famous backwards ‘K’–once again. Case in point, this 2015 Nickey Camaro. 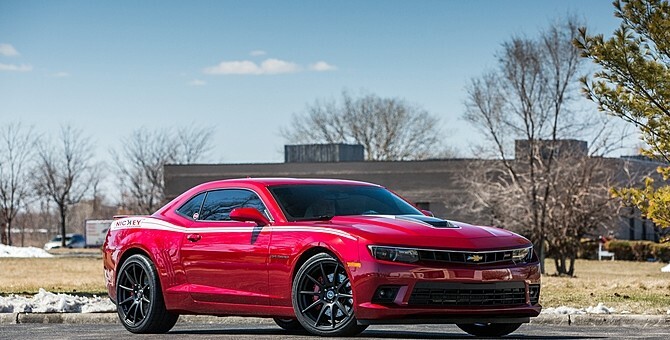 This particular fifth-generation Camaro has been treated to a whole host of modifications like new wheels, drilled and slotted rotors, and a black and white interior replete with ‘Nickey’ logo embroidery. But what you really want to know is that the 6.2L V8 has been treated to a Magnuson TVS 2300 supercharger, and a 3-inch stainless-steel chambered exhaust system. Sound like your kind of ride? Head down to Mecum Indy in Indianapolis between May 12-16 and this new Nickey could be yours. You’ll also have to scratch together a healthy amount of coin: Mecum estimates this Camaro will go for anywhere from $60,000 to $80,000. Previous story Now Ex Top Gear Presenter Jeremy Clarkson Currently Testing C7 Corvette Z06?